Super Mario Bros. is a side-scrolling platform game that took the world by storm when it was released in 1985. The game features eight levels with four stages in each; this might sound like a lot but in reality most stages can be completed in under a minute if you’re comfortable with platform games. For a 1985 title though it has tons of variety including a mixture of outdoor platforming, underground areas, swimming stages, as well as end of level sections in Bowser’s castle. On a few occasions the latter features maze-like areas where you must navigate through a particular route in order to advance; I’m not sure this gameplay element has been seen in any Mario game since and it strikes me as having more in common with the Zelda series than anything else. Although you’ll probably breeze through the first few levels the difficulty really ramps up once you reach level 7 due to the amount of Bullet Bills and Hammer Bros that get in your way! There are lots of cool secrets in the game including the end of level fireworks (done by hitting the flagpole with a certain amount of time remaining) and the hidden warp pipes that advance you to a later level of your choosing. The music is top notch and the fact that Nintendo still use the tracks in modern Mario titles shows you how memorable they are. The SFX are another highlight and the sound of Mario shooting a fireball or collecting a coin is instantly recognisable, even to the most casual gaming fan. If I had to nitpick, the occasional flicker can cause some issues (especially when Bowser throws his hammers) and the controls aren’t quite as responsive as future Mario titles. These are very minor niggles though and they don’t detract from an otherwise superb experience. Super Mario Bros. is a groundbreaking title that can still be enjoyed by gamers young and old. It’s influence on gaming history cannot be overstated and it certainly deserves all the praise it’s received over the years. Random trivia: Believe it or not, there are still groups actively trying to find glitches in this game. 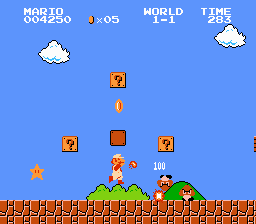 The most well known is Minus World but more recently some people have found elaborate ways to get infinite 1-ups!